Kalanchak remains blocked while Chaplynka only processes those entering Crimea. Russian border guards have resumed the processing of pedestrians and transport through the Chonhar checkpoint on Ukraine's administrative border with Russia-controlled Crimea, Ukraine's State Border Service has said on its website. "The Russian occupying troops have resumed the passage operations opposite the Chonhar checkpoint. Thus the Kalanchak checkpoint remains fully blocked for now as the occupiers do not let people and transport move either way," the statement reads. 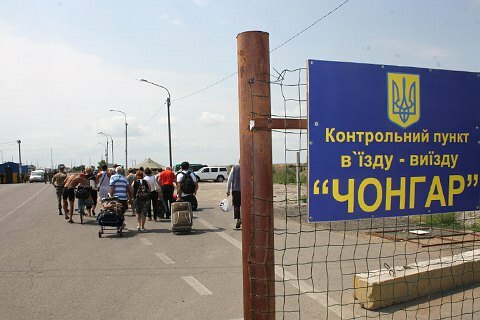 The Chaplynka checkpoint only processes those entering Crimea from mainland Ukraine. The border service added that the situation along the administrative border remains "tense but manageable". For reasons still unknown, the Russian authorities blocked transport and pedestrians from entering the peninsula through all three checkpoints on the administrative border with Ukraine.